At Frontier Eye Care, we have a huge selection of glasses to improve your vision, including the latest in designer frames! Let our opticians help you find the perfect fit for your unique style! We want you to see your best, but we also want you to look your best. 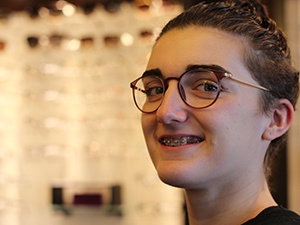 Come relax in our designer eyewear gallery, and let our eyeglass frame consultants help you find the look to match your personal style. Maybe you’d like eyeglasses with a dramatic flair, or perhaps frames that convey a hip, contemporary image. Or maybe you’re going for an understated yet confident look. Whatever your needs our huge selection of eyeglass frames will have you looking great! We carry the the latest eyeglasses and sunglasses for the whole family. Our favorites among women are SALT, Lafont Paris , Guess, Vera Bradley, Nine West, and Badgley Mischka. For men, our great masculine styles include Oakley, Orvis, Nike, Modo, Georgio Armani, Calvin Klein, Gant, Flexon and more! Teens and tweens also love our new styles from Issy & LA, Bongo, Candie’s, Skechers, and Juicy Couture. For kids, we recommend strong flex frames and styles from Disney and X-Games. You’ll be seeing the world clearly and comfortably with the latest innovations in lens materials and designs, including digital free-form progressive lenses and the thinnest lenses available anywhere. Our goal is for you to enjoy your life to the fullest with the most comfortable, efficient, and clear vision possible. Our eyeglass frame-and-lens experts will explain the benefits of each type of lens and make sure your vision is optimized. As far as sunglasses go, we’ve got you covered there, too! We carry a fantastic selection of sunglass styles from Ray Ban, Coach, Nike, Guess, Harley Davidson and more! Most are available as prescription or non-prescription sunwear. We also carry a great selection of safety glasses, and value frames for that backup pair. Ask our eye doctor, optometrist Dr. Doug Hodgson, for recommendations on eyeglass frames and lenses that can optimize your vision. 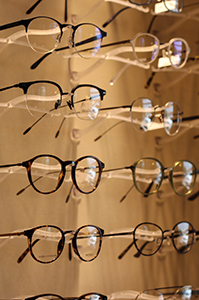 Stop by our Eyewear Gallery to browse our large selection of frames. For questions about eyeglasses, frames, and lenses or to make an appointment for an eye exam, call our office at (307) 472-2020.